Look at how clean that cabin is! J'Fro & Swishen leading some pool activities! Are we in High School Musical yet? Skoobs and Schnitz get soaked! Cabin Clean up is our time to wake up and tidy our bunks and our cabins. There is a daily competition for Cabin Clean Up. Morning Watch is our time of morning worship. Every day we have different staff members run sessions on topics like friendship, courage, love, and more that can help us in our everyday lives and our camp environment! Every day we have what we like to call Interest Sessions! They are a series of different activities where each camper gets to choose what they want to do! We always run Polar Dip (an early morning swim) and every week we offer different activities like yoga, basketball and lots more! We are very lucky to have amazing cooks that provide us with breakfast, lunch, and dinner! If you keep looking around the our website, you just might find our menu for each week! We are also happy to accommodate any dietary restrictions such as vegetarianism and veganism, as well as any allergies you may have! At the end of our meals we also like to take the chance to give a big thanks to our cooks, who work very hard to feed us every day! Some of our meals even have special themes like One Utensil to keep things exciting! One of the most important aspects of everyday is keeping ourselves healthy and happy! That starts with good hygiene and our twice a day Toothy Time! While the campers brush their pearly-whites, they might even get some entertainment in the way of silly songs led by our awesome counsellors! Morning sessions are a series of activities we do every morning including Nature/Games, Crafts, Christian Education (CE), and Swimming! Nature and Games are run by your counsellors, and can range anywhere from fishing to basketball and kickball. Crafts is run by our weekly Craft Director! This is a lot of campers favourite part of the day. In the Craft Cabin we have endless craft supplies to make all sorts of unique crafts from ideas that the Craft Directors find and plan for us. Christian Education We are very happy to welcome our special guests from the Oxford United Churches in the form of our CE Directors every week! CE is our time of the day to learn about Christianity in fun and inventive ways! Everything from games, to crafts, to acting is employed to get the good word out. 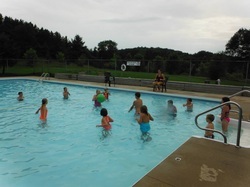 Swimming is run every week by our NLS certified lifeguards! 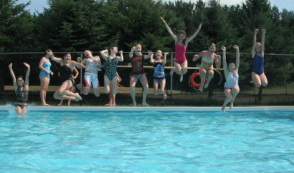 This session involves water polo, aqua zumba, water games, synchro swims and any other activity the LGs may plan for us! For those who just want to have a relaxing swim, we have 2 other free swims during the day to relax and cool off with your friends and staff. Now seems like as good a time as any to explain our "Gopher" system! For every meal of the day, each cabin is required to send two people to set the table beforehand. Why are they called gophers? Because they are also the people who "go for" things during the meal, including things that they might run out of like milk or for extra mac n' cheese (it goes pretty fast)! Finally, the gophers help to wash the dishes after the meal! We love this system, because we split the work and learn responsibility in the process. Plus after all the cooking the cooks do for us, the least we could do is clean up! Did we mention there is a BIG rule that goes with our meals? We as a staff have a strict NO ELBOWS policy! That means if you put your elbows on the table when you're eating you will get called out! We do a lot of silly punishments for this crime against table manners! Everything from doing the hula to proposing to a staff member is fair game! But if the staff do it..they have a lot worse of a punishment in store! CabinTime is the part of the day that we get to hang out with our cabin mates in our cabins! Other than that, what happens during this time is totally up to you! If you want to write letters or read a book, you can! If you wanna make a mattress fort in your cabin, you can! That's what's so great about Cabin Time! 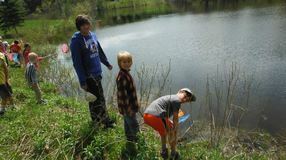 Our Older campers get to pick an activity to take part in each week. They choose one activity and take part in it 4 days of the week, working on skills and playing games/ working towards an end of the week presentation. These activities change each year based on what staff we have to coach them. We have had everything including: Dance, Musical Theatre, Archery, Basketball, Soccer, Beach Volleyball, Baseball, and martial arts. Coaches work with campers of all skill abilities to ensure everyone is learning some skills, but also having a ton of fun. Our afternoons for Jr. Campers vary in what we do. Some days we do something special as a group. This can include things that are lead by our staff, such as Carnival or Spa Day or can be special presenters we bring in. Each of our Jr. weeks includes a carnival. This is where we set up small games and campers play them to try and earn tickets. Tickets can then be used to get small prizes or to buy things like balloon animals and temporary tattoos. Our special presenters vary each week. In the past we have had things such as fishermen, Waterloo Science Programs, Fire Trucks, visits from Elsa from Frozen, Wild Ontario with Birds of Prey, the K-9 unit, and a magic show. Sometimes we also do Passports, which gives campers the opportunity to choose your own adventure! Staff set up a variety of activities including things like: sports, games, crafts, teambuilders, nail painting, bracelet making and more. Campers then get to choose which ones they want to take part in that day. We have two Free Swims every day where you have time to chill and relax in the pool! If you don't feel like swimming, we also run "Interest Sessions" of different activities that we normally wouldn't be able to fit in the day. Card games, extra craft time, nail painting...you name it! After this point, the schedules for the weeks will differ slightly, but the activities will remain the same! Sr Coed will have bedtime at 10, Jr weeks will have bedtime at 9, and Intermediate will have bedtime at 9:30! What is Evening Games? Its the point of the day where we play one massive "all-camp" game. 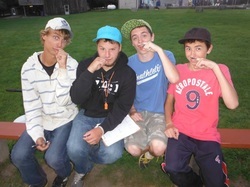 Every cabin and counsellor gets involved in a number of games where we compete for honour and glory! With everything from Braveheart to Stones to the famous "Counsellor Chess", Evening Games is a point in the day that everyone looks forward to! Did you know that Kumbaya is Creole for "Come by here"? Have you heard about our friend "Fred" who lives on the Staff Path? Do you know about what to do if you meet a Martian? You can learn all this and more from our amazing Campfire songs! We may not have the best voices but we love to sing loud and proud! Vespers is our evening version of Morning Watch, where we reflect on our day and thank God from "Us here at Camp Tanner".